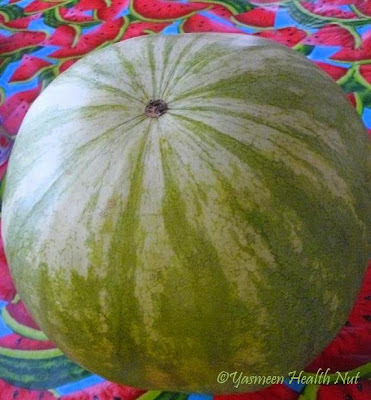 I'm a disaster at selecting water melons.The ones I pick always turn out to be either unripe or not so juicy.How do you select a perfect water melon,one that's ripe red and juicy?Here is a simple tip from Mr.HealthNut- a melon that's heavy,with nice and green sheen and a yellowish-white spot at the bottom.We never miss buying them every week in summer,He is more of an expert than me when it comes to picking the right melon.He finds them the most rejuvenating food after the workouts,I totally agree. 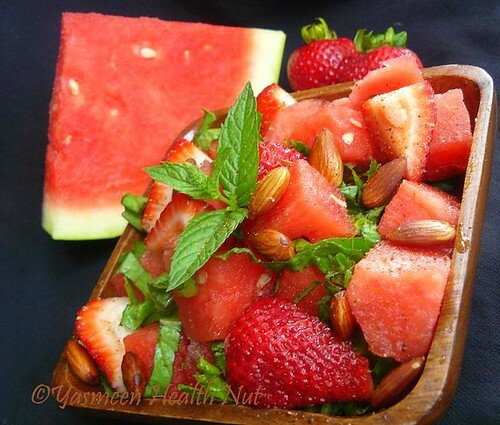 The sweet water melon and strawberries with mint and nutty almonds make a refreshing salad for the sweltering hot days.Not mention the salad is loaded with much needed anti-oxidants. Prepare the dressing,whisk all the ingredients together in a small bowl.Pour over melon,berries and almonds in large salad bowl.Gently toss to mix.Keep cool in fridge until its time to serve. The thirst-quenching Melon salad is off to Meeta's Monthly Mingle :Marvelous Melons ,hosted this week by Chew On That . 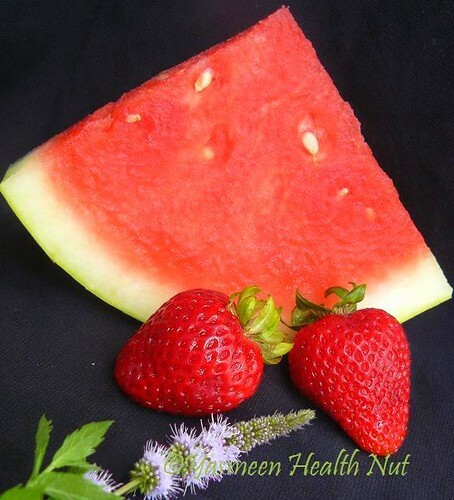 **Water Melon : A Natural Viagra? Very refreshing salad with beautiful colours. Thanks for the tip on selecting a good melon. Been a while since I have been here...love the new look and how have you been? This salad looks really beautiful,Yasmeen. Wow you cant find a much better salad for the summer I bet !! wonderful is the word Yasmeen..and the clicks are awesomeeee. Refreshing and juicy salad Yasmeen! Looks mouthwatering. so very refreshing.Love your page header. An awesome combo! That salad looks very refreshing! What an excellent salad, perfect for summer and hot weather! Wonderful salad Yasmeen. Would love to have just this for lunch. Sounds like a delight, I love the almonds in this salad, very nice! What a cool refreshing salad and an amazing click. Good tip also for selecting the melon. 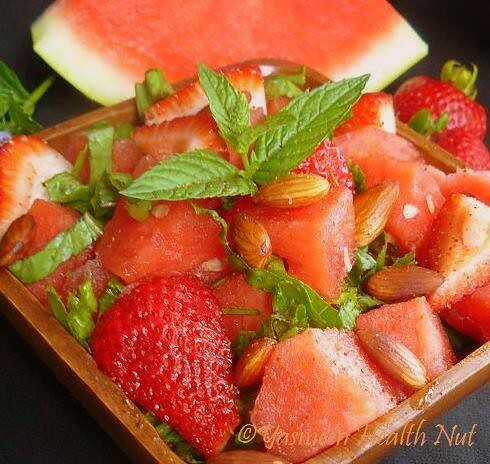 This salad looks soo refreshing !! Delicious colour and cool salad..! Whoa,wat a combo,never had this combo,love it!! Awesome,Love the salad.Watermelon is very good and is much preferred here as well.Love all the clicks. Thanks for accepting the late entry.Have linked the post to the event and have mailed you as well. Melons are best part of summers.The salad looks very refreshing. I love the presentation,looks very refreshing too. Certainly a thirst quenching bowl,thanks. I've heard some time before about using the watermelon as an ingredient in a salad.Well,I've said that to my parents and they were more than surprised,because here watermelons are so common to eat during the summer,but never with salt or pepper.But,it could be an idea :)!Or it could be ejoyed as a fruit sald,or :)? I have now at home the watermelon and the almonds.All I need are some strawberries and I'm good to try your combination :). This looks so refreshing. Perfect summer salad. I like your pictures. That salad makes me crave it and I like the textures there with the nuts. So summery,this is a cool salad. I love the idea of savory salad with with melons. Love the way you turn up such simple things into wonderful healthy meals! Looks really yummy...the colors are so very refreshing. My dad swears that the best way to pick a melon is to smell it. If it has a melony scent then it's ripe. If it doesn't smell at all, then it is not ready. This salad is a pink and red delight!